Mismanage giant water system + use weather modification to overfill giant water system = flooding of biblical proportions. 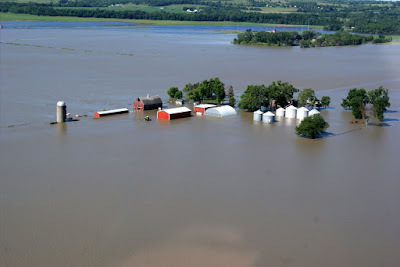 Flooding of biblical proportions justifies opening levees and resulting in destruction of farmland. Government buys up now useless farmland. Win win win win. Land grabbing. Grab the land ==> control the food and water. Control the food and water ==> control the people. All that's needed is a JUSTIFICATION to grab the land in the first place. CONVENIENTLY, that has been arranged, thanks to Mother Nature (wink wink wink). UPDATE: Stephen Lendman today makes the case that nuclear power is inherently unsafe, in any form, which I find quite convincing, considering the total lack of consideration the criminal U.S. government has for the well-being of the people here. 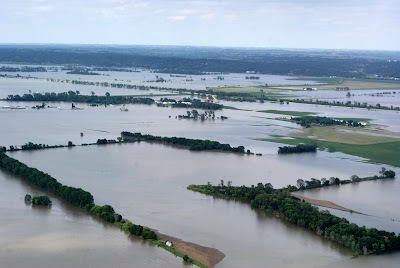 Also, Joe Herring has an excellent article surmising whether or not the Missouri River flood of 2011 is a result of purposeful action taken and policies implemented by the U.S. Army Corps of Engineers. Neglected farmers taking matters in their own hands? An investigation is underway in attempt to determine who used explosives to blow up levees upriver and east of Fort Calhoun Nuclear Station around 10:00 Friday morning. In the rich farmland where families still depend on crops for a living and American families depend on those crops for their dinner table, officials report there has been "no damage" to the area, assuring that they had nothing to do with these levee explosions according to KETV News in Omaha, Nebraska. 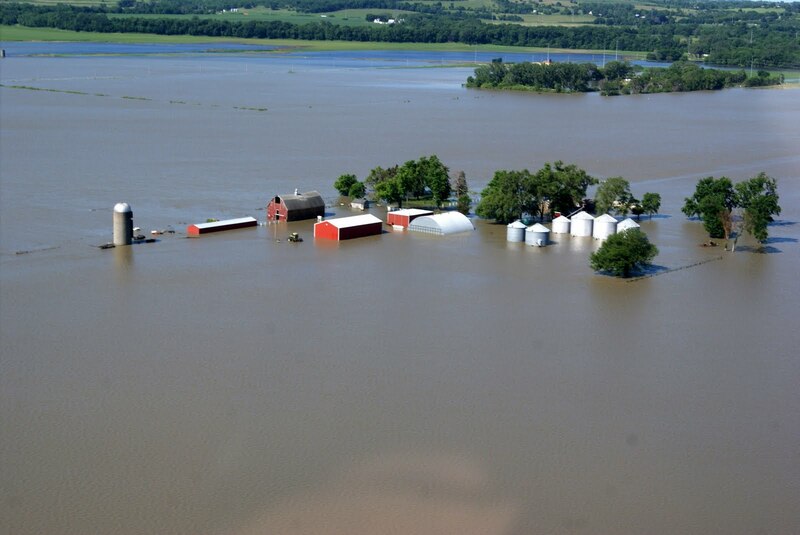 Farmers have been increasingly disgruntled with the way officials are managing the epic flooding. The levee explosions come less than a week after "workers" punctured the aqua-dam, recently erected to help protect the nuclear station from rising waters, sending thousands of tons of flood waters into the nuclear plant area. "We had nothing to do with it," stated Matt Wilber, the Pottawattamie County Attorney who is overseeing the county response to flooding. "Someone went in and basically breached that levee, blew it up," Wilber told reporters for KETV. "So, the water that was pooling there is now basically flowing back down." County officials reported that a half-mile stretch of Vanmann #30 levee near Desoto Bend was mechanically excavated and then lowered by using explosives Friday morning but they did not know who was responsible according to KETV News. People in the Fort Calhoun area heard explosions and then realized the levees were being exploded. They phoned Emergency Management Coordinator Jeff Theulen on Friday morning, wanting to know why levees were being blown up. "One caller claimed to have witnessed the explosion." reports KETV. The U.S.-flagged ship, called "The Audacity of Hope" -- the name of President Obama's 2006 book -- is currently docked in Greece and is supposed to set sail by the end of this week along with ships from Ireland, Spain, Italy, Greece and other countries. More than 30 Americans are booked for passage on the Audacity of Hope. Can anyone out there read those excerpts and not concede the fact that our government is run by a bunch of murderous psychopaths that are loyal to a criminal foreign entity and not the people they "represent"? It's been clear for some time now, at least to me, that this government cares nothing about the interests of the people of America, and is in fact implementing the final finishing touches on a completely fascist, tyrannical ordering of society. All one needs to do is take a look at what happened when Wall St. wrecked the economy: they went to their buddies in Washington D.C. and made the people of the United States liable for their losses, criminality and reckless behavior. Virtually everyone in the U.S. was against the banker bailouts, but what happened? All of our representatives voted for it. Now we have representatives of the United States government, at the highest of levels, arguing that U.S. military forces should assist Israel in illegally attacking and "disabling" a rag tag group of boats filled with humanitarian aid and activists that pose no threat to anyone. Could it be any clearer how pathetic and traitorous this government has become? The Death of American Democracy from Anthony Lawson on Vimeo. At the very beginning of the video, Anthony Lawson talks about the 3,000 alleged victims that died in the 9/11 attacks, a point I would generally take at face value. However, after listening to this and this, I'm highly suspicious of the generally accepted story of the "victims of 9/11." I'll have more in the near future about these and other subjects. IRAQ'S parliament Speaker, on a visit to Washington, will query American officials about $17 billion in missing oil money, a Baghdad politician said today. Head of parliament's anti-graft committee Baha al-Araji said Speaker Osama al-Nujaifi, who left for Washington on Tuesday, would bring up the question of the missing billions, which have been under investigation for years. Last week, US officials acknowledged that $US6.6 billion in Iraqi reconstruction funds had disappeared. Iraq says $US17 billion is missing, and was stolen by corrupt US institutions. "Nujaifi is visiting the United States to discuss several issues, including the missing funds," Araji said. "We spoke with the US forces in Iraq (about this issue) but we didn't receive an answer," he said, adding that Baghdad had approached the United Nations to help trace the money. The cash was from the proceeds of Iraqi oil sales after the 2003 US-led invasion. It was placed in the Development Fund for Iraq, but went missing in 2004, when US envoy Paul Bremer's Coalition Provisional Authority was governing Iraq. In a May 11 letter to the UN Security Council, the Iraqi parliament's anti-graft committee accused US institutions working under the CPA of stealing the money. "The US institutions (occupation forces) working in Iraq committed a financial crime, stealing the money of the Iraqi people that was allocated for the development of Iraq," said the letter to the UN. "The sum was $17 billion," it said. The wars our government is waging in our names around the world are taking the lives of members of our Armed services while also sucking up absurd amounts of taxpayer funds which we will likely never see any return on. This is most prevalent in the past decade's nation building efforts, all of which have been failures by most metrics. Remember when Donald Rumsfeld admitted the Pentagon lost $2.3 trillion the day before 9/11? Oh yeah, don't forget about the Pentagon Comptroller at the time of 9/11, Dov Zahkeim, who just happened to be CEO of Systems Planning Corporation, a corporation involved in developing some interesting technology related to 9/11, prior to joining the Pentagon in the Bush administration. See here for more. And do you remember when Federal Reserve Chairman Ben Bernanke told Senator Bernie Sanders he wasn't going to tell him and the American people who the Federal Reserve loaned all of their money to? As you can see, since the Zionist FALSE FLAG/INSIDE JOB on 9/11 and the fraudulent wars against the Muslim world, we’ve seen an unprecedented, unabashed looting of the American tax payers and U.S. Treasury. We’ve seen an utter destruction of the nations and peoples in the Muslim world our military has illegally attacked, along with a complete evisceration of the U.S. Constitution and any sense of decency and justice coming from the U.S. government. President Obama recently gave a speech on the supposed withdraw of U.S. troops from Afghanistan. Literally everything he said was a lie. A fairy tale. An artificial reality created by the elite political and media class that have all either been bought off, bribed, blackmailed or otherwise corrupted by the Zionist controlled global power elite network and banksters behind the madness and darkness presently manifesting itself everywhere you look on this planet. Wars historically are based on lies and propaganda, often initiated by false flag events and a distortion of reality presented by the Jewish owned media . They are fought by the poor for the benefit and profit of the rich. To all my fellow Americans out there in the military: it’s time to come home. It’s time to stop fighting these criminal, fraudulent wars. It’s time to come home and arrest the Federal Reserve Board and Chairman, Wall Street big wigs, Obama and his entire administration, and all leaders of Congress. It’s time to clean house, and the only way I see that happening is if the folks in the military say, “No more wars for Wall St. and Israel. No more lies." Greek Prime Minister George Papandreou's reshuffled Cabinet survived a vote of confidence early Wednesday despite widespread opposition to budget cuts he says are needed to prevent a government default. International lenders have demanded Greece cut spending, lay off public workers, raise taxes and raise 50 billion euros ($71 billion) through selling off state-owned enterprises in exchange for another bailout deal for the cash-strapped nation. Weeks of protests against the austerity measures spurred Papandreou to shake up his government last week, leading to Wednesday's 155-143 vote. That's right, the IMF and other international lenders want to force the Greek people to pay off the odious debt incurred by the government. What do the people of Greece have to say about this? "I believe we should go bankrupt and get over with it. These measures are slowly killing us," said 22-year-old student Efi Koloverou. "We want competent people to take over." Julietta, a public sector worker who declined to give her full name, said: "We want them all to get out, to go home." Inside parliament the opposition poured similar disdain on the government. "This is not a programme to salvage the economy, it's a programme for pillage before bankruptcy," said Alexis Tsipras, head of the small opposition Left Coalition. Imagine being forced to work less hours, take a reduction in your income, give up your private property for collateral, and receive less benefits just so you can have yet another loan to hold you over until the next time you run yourself into a hole. Now apply that same concept to a global scale, and that's what you have with the IMF and other global financial institutions, including the Federal Reserve, forcing countries like Greece to accept. They've been doing this for a while now in many countries around the world, plundering, corrupting and otherwise wrecking the economies and livelihoods of millions. People everywhere are getting sick and tired of the greedy bankers pillaging and defrauding the entire world economy, robbing and stealing from the tax payers in an attempt to satiate their endless desire for more wealth and control. Aren't you? Israel Navy commander Adm. Eliezer Marom issued a stark warning on Sunday for the organizers of the Gaza flotilla intended to set sail at the end of the month. "The Navy has prevented and will continue to prevent the arrival of the 'hate flotilla' whose only goals are to clash with IDF soldiers, create media provocation and to delegitimize the State of Israel," Marom cautioned, speaking during the Israel Navy Divers' Course concluding ceremony. The Navy commander called on all parties involved to do everything they can to prevent the departure of what he called the "provocation flotilla." He said that a number of figures in the international community have said "that a humanitarian crisis in Gaza is nonexistent, and that all supplies may enter Gaza via the land crossings in a coordinated manner." Marom also added that the flotilla allows Hamas to get equipped with an unlimited amount of weapons in order to carry out terror acts on Israel. The Free Gaza organization has declared that it is "determined" to sail to Gaza in a "freedom flotilla" planned for this month, despite a recent message by the Turkish IHH saying it was reconsidering its participation. "Unfortunately and incredibly, Israel is threatening to use even greater violence against Freedom Flotilla II, which will sail to Gaza the end of this month. Its threats have included the use of snipers and canine units," Free Gaza claims. "Even more deplorable, world leaders, rather than demanding that Israel halt its provocative behavior towards us and refrain from once again attacking unarmed civilians, have called the Flotilla initiative a provocation and have asked countries on the Mediterranean to prevent us from sailing." "For too long our national and international leaders have passively watched the tragedy of Gaza – of all of Palestine. The grossly unjust and unlawful blockade of the Gaza Strip and the ongoing belligerent occupation of the rest of Palestine – imposed by Israel and tolerated by the world community - is a stark case of states sacrificing principle and human rights for power and self-interest," Free Gaza stated, citing a recent alert by the Palestinian Center for Human Rights of a shortage of medicine in the Gaza Strip. Traitorous dirtbags in the U.S. government have actually called on U.S. naval forces to assist the Israelis in their efforts to prevent the humanitarian flotilla from reaching Gaza, and official U.S. policy is overwhelmingly against the flotilla. Organizers of a US boat that will join a humanitarian flotilla trying to break the Israeli sea blockade of the Gaza Strip said Monday they were only allowed to bring letters of friendship to Palestinians with them under US law. A total of 36 US citizens and four crew members will assemble in Athens in coming days to board the US-flagged boat, The Audacity of Hope, and then join other ships in the high seas before sailing toward Gaza, possibly by the end of the week. The organizers said the US government prohibitedthem from bringing humanitarian and medical assistance to Gaza, which is headed by Hamas. Thus they said they will carry 3,000 letters to the Palestinians, but other ships may carry relief supplies. It appears to be only a matter of time before the Israelis commit yet another crime against humanity. It is probably about time that the U.S. government and it's NATO allies go to war against Israel, the only country that has actually attacked the U.S. and the prime conspirator in the FALSE FLAG/INSIDE JOB on 9/11. 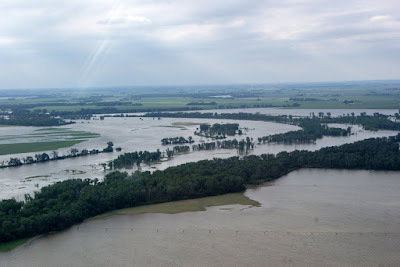 See here for my original posting on the flooding on the Missouri River and the nuclear power plant at Fort Calhoun, Nebraska, about 25 miles north of Omaha, Nebraska, my hometown. The following pictures were taken by Larry Geiger, and can be found here. A farm house and surrounding properties just north of Omaha. North of Omaha looking south. Interstate 29 is completely under water. 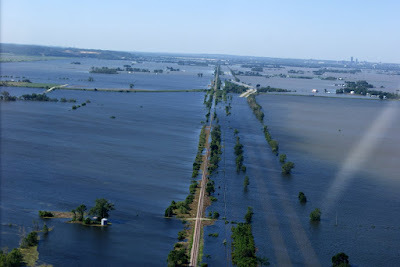 The 2011 Missouri River flood is of epic proportions. 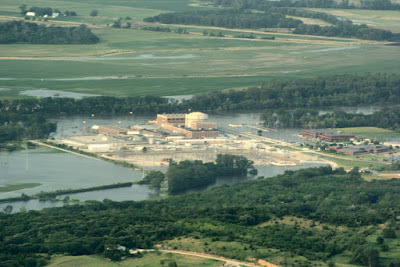 The nuclear power plant at Fort Calhoun is completely surrounded by flood water. The National Weather Service said the river measured at 44.75 feet surpassing a record of 44.3 feet set in 1993. Flood stage is 33 feet. The U.S. Army Corps of Engineers said the river level at Brownville surged two feet from Saturday morning to Sunday morning. Col. Bob Ruch attributed that to heavy rain on the Nishnabotna River, which flows into the Missouri, and to some erosion along a levee upstream at Hamburg, Iowa, that created a water pulse. The Nebraska Emergency Management Agency says water was flowing over a levee there and into farmland, but the levee is being built up. Nemaha County emergency manager Renee Critser said when workers built up one section of the levee to alleviate the overtopping, water would flow over in another spot. Downstream in northwest Missouri, several levees were failing to hold back the surge of water being released from upstream dams. A hole in the side of a Holt County levee continued to grow Sunday, deluging the recreational area of Big Lake. Authorities said water began pouring over levees Saturday night in Holt and Atchison counties, flooding farmland and numerous homes and cabins. Residents with swamps for back yards said worrying is worthless. “It's just kind of part of living near the Missouri River," said one. Homeowners and farmers are beginning to count their losses. “The best crop we've ever seen and the best prices and we're gonna get a zero paycheck this year." The supply of sand used to fill hundreds of thousands of bags needed to fight off the swollen Missouri River is running low after weeks of relentless flooding. It's a problem that could get worse as the river is expected to remain high through August, making it unsafe to gather sand from the easiest place to get it: the river itself. The sand shortage comes as the bloated river rose to within 18 inches of forcing the shutdown of Cooper Nuclear Plant at Brownville, Neb. It stopped and ebbed slightly Monday, a reprieve caused by levee breaches in northwest Missouri. During the next few days, the river is expected to rise as much as 5 to 7 feet above flood stage in much of Nebraska and Iowa, and as much as 10 feet over flood stage in parts of Missouri. It could stay above flood stage into August. The Army Corps of Engineers is monitoring the sand supply, said Jud Kneuvean, chief of emergency management for the corps' Kansas City District. He said a ton of sand produces about 60 sandbags. Sand also is piled along weakened areas of levees to prevent seepage. "You need lots of sand, lots of sand," Kneuvean said. In a pinch, other materials can be used — everything from gravel to lime products. "Unfortunately, though, when some of those get wet they harden up and it decreases the flexibility of sand bags and it basically forms concrete," Kneuvean said. Dan Sturm, the fire chief in Hamburg, Iowa, joked that his community deserves blame for thinning sand supplies. "We probably took all the sand," Sturm said. Hamburg has filled at least 250,000 sandbags and dumped truckloads into fabric-lined metal-frame baskets to create a makeshift barrier to hold back water pouring through a breached Missouri River levee. Downstream, St. Joseph has filled 365,000 sandbags to reinforce low spots on levees and protect city buildings and the airport at Rosecrans Air National Guard base, said public works director Bruce Woody. The local supply of sand quickly ran out after flooding began in St. Joseph, and the river was moving too swiftly to allow for dredging, Buchanan County emergency director Bill Brinton said. The county had to ship in sand from Topeka, Kan., and Kansas City, Mo. Atchison, Kan., also had to purchase sand from the Kansas City area, about an hour's drive away, city manager Trey Cocking said. Suburban Kansas City-based Ash Grove Aggregates & Ready Mix, which sells sand, typically dredges the river at St. Joseph for sand. Because the river is so high and the current so strong, the company has been forced to cease dredging and may not start again until August, company president Allan Emby said. Despite the shortage, he is refusing to raise the price. "I can't morally in my own brain think about increasing prices because of flooding," Emby said. Mark Becker, spokesman for Nebraska Public Power District, said the river rose to 900.56 feet at Brownville on Sunday, then dropped to 900.4 feet later in the day and remained at that level Monday. The Cooper Nuclear Plant was operating at full capacity. The utility sent a "notification of unusual event" to the Nuclear Regulatory Commission when the river rose to 899 feet early Sunday morning. The declaration is the least serious of four emergency notifications established by the federal commission. Cooper is one of two nuclear plants along the Missouri River in eastern Nebraska. The Fort Calhoun Station, operated by the Omaha Public Power District, is about 20 miles north of Omaha. It issued a similar alert to the regulatory commission June 6. The river continued to rise along the Missouri-Kansas border, but by Monday afternoon, there were no new trouble spots. Craig Sheppard, manager of the levee that protects the airport in St. Joseph, said the earthen structure was in good shape and should hold, barring unforeseen heavy rains to the north. "As far as picking up and running from the river, there's no need to do that," Sheppard said. In Andrew County, north of St. Joseph, a couple of trouble spots along levees have been stabilized. Most residents in towns threatened by high water have already left or are preparing to do so, said Roger Latham, emergency management director for the county. "We know it's all going to come down here eventually, and the concern that we have about the levees is they really haven't been tested since 1993," Latham said. Brig. Gen. John McMahon, the commander of the U.S. Army Corps' Northwestern Division, traveled to Missouri's capital city Monday at the behest of U.S. Reps. Blaine Luetkemeyer and Vicky Hartzler to meet with local levee district managers, mayors and county commissioners concerned about potential flooding. McMahon said the corps' had previously released enough water from upstream reservoirs to account for a larger-than-usual snowmelt, but had not anticipated this spring's unusually larger rainfalls that occurred in Montana and parts of the upper Midwest. 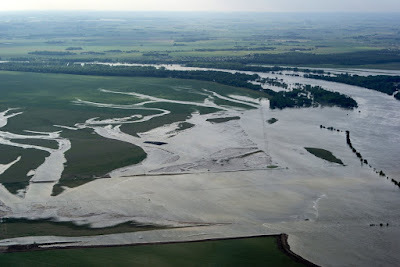 If more heavy rains hit the upper Missouri River basin, McMahon said the corps may have to increase the already record flow of 150,000 cubic feet of water from Gavins Point dam in South Dakota. "I dread that thought, but we could have to do it. It's a very real possibility," McMahon said. In Kansas' northeast corner, Missouri River levees were in good shape. Yet there was still concern as rain forecast into Tuesday could overload drainage systems in the small towns of Wathena and Elwood. "The main concern right now is internal flooding," county emergency director Julie Meng said. "We'd be flooding from the inside." Safety has taken a back seat to cost-cutting at most of the nation's nuclear power plants, sparking fears that America could be facing its own Fukushima disaster. An investigation by the Associated Press has revealed federal regulators are repeatedly weakening - or simply failing to impose - strict rules. Failed cables. Cracked concrete, corroded metals and rusty underground pipes — all of these and thousands of other problems linked to aging were uncovered in the AP's year-long investigation. IranContraScumDid911 has uploaded some very informative videos regarding the flooding in Nebraska and it's impact on the nuclear power plants there. 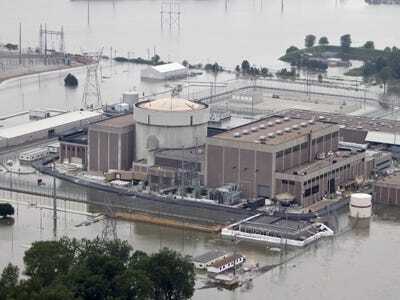 A nuclear plant was inches away from being engulfed by the bloated Missouri River after several levees in the area failed to hold back its surging waters, raising fears it could become America's Fukushima. Dramatic pictures show the moment the plant was threatened with being shut down today, as water levels rose ominously to within 18 inches of its walls. The river has to hit 902 feet above sea level at Brownville before officials will shut down the Cooper Nuclear Plant, which sits at 903 feet. It stopped and ebbed slightly yesterday, a reprieve caused by levee breaches in northwest Missouri - for now. Flooding is a major concern all along the river because of the massive amounts of water that the Army Corps of Engineers has released from six dams. Any significant rain could worsen the flooding especially if it falls in Nebraska, Iowa or Missouri, which are downstream of the dams. The river is expected to rise as much as five to seven feet above the official 'flood stage' in much of Nebraska and Iowa and as much as 10 feet over in parts of Missouri. The corps predicts the river will remain that high until at least August. Nebraska Public Power District spokesman Mark Becker said the river rose to 900.56 feet at Brownville on Sunday, then dropped to 900.4 feet later in the day and remained at that level on Monday morning. The Missouri River set a new record Sunday at Brownville when its depth was measured at 44.4 feet, topping the previous record of 44.3 feet set during the 1993 flooding, according to the National Weather Service. Approximately 110,000 acres of land are affected by the flood waters in Nebraska, the Nebraska Emergency Management Agency said Tuesday. Citing data from the National Geospatial-Intelligence Agency, NEMA said this includes agricultural and non-agricultural land. The total includes land affected by the Missouri River, but only Scottsbluff, North Platte and Grand Island on the Platte River. Approximately 66,000 acres of this total is agricultural land, NEMA said. The World-Herald also has a county-by-county map with updates on the flooding along the Nebraska-Iowa-Missouri borders today. Deanna Spingola's official website is here, and here are her archived full interviews and lectures. She'll get you up to speed on a lot of subjects, and offers an interesting and well presented perspective on many important historical subjects. Enjoy Daddio!!!! Oppppssss, I mean Popo!!!!! We love you!! Can't wait to see you back in Nebraska!!!!!! Happy first Father's Day!!! Some of my favorites below!!! A federal judge has approved a request by prosecutors to officially dismiss all criminal charges against Osama bin Laden. The order was made public Friday, more than six weeks after bin Laden was killed by the U.S. military in a raid on his hideout in Pakistan. Such requests are procedural and routine in case where defendants named in indictment die. The al-Qaida leader was indicted in June 1998 in federal court in Manhattan on charges related to the terrorist attacks on the two U.S. embassies in Africa. It's the only federal indictment to charge him. The charges included conspiracy to kill U.S. citizens, conspiracy to destroy U.S. property and use of a weapon of mass destruction. How convenient. Flush this one down the memory hole folks, we've already got a new Emmanuel Goldstein in our sights. Funny the article didn't even mention 9/11, as most Americans ignorantly believe that bin Laden and his cohort of radical Islamic terrorists were behind that attack, when in fact the exact opposite seems to be the case. IranContraScumDid911 has an excellent You Tube page, where I found the video below and also this brief background on the situation. Osama bin Laden's role in the events of September 11, 2001 is not mentioned on the FBI's "Ten Most Wanted" poster. Rex Tomb, Chief of Investigative Publicity for the FBI responded, "The reason why 9/11 is not mentioned on Osama bin Laden's Most Wanted page is because the FBI has no hard evidence connecting bin Laden to 9/11." Tomb continued, "Bin Laden has not been formally charged in connection to 9/11." Asked to explain the process, Tomb responded, "The FBI gathers evidence. Once evidence is gathered, it is turned over to the Department of Justice. The Department of Justice then decides whether it has enough evidence to present to a federal grand jury. In the case of the 1998 United States Embassies being bombed, bin Laden has been formally indicted and charged by a grand jury. He has not been formally indicted and charged in connection with 9/11 because the FBI has no hard evidence connecting bin Laden to 9/11." Haas pauses to ask the question, "If the US government does not have enough hard evidence connecting bin Laden to 9/11, how is it possible that it had enough evidence to invade Afghanistan to 'smoke him out of his cave?'" Through corporate media, the Bush administration told the American people that bin Laden was "Public Enemy Number One," responsible for the deaths of nearly 3,000 people on September 11, 2001. The federal government claims to have invaded Afghanistan to "root out" bin Laden and the Taliban, yet nearly six years later, the FBI said that it had no hard evidence connecting bin Laden to 9/11. Though the world was to have been convinced by the December 2001 release of a bin Laden "confession video," the Department of Defense issued a press release to accompany this video in which Secretary of Defense Donald Rumsfeld said, "There was no doubt of bin Laden's responsibility for the 9/11 attacks even before the tape was discovered." In a CNN article regarding the bin Laden tape, then New York Mayor Rudy Giuliani said that "the tape removes any doubt that the US military campaign targeting bin Laden and his associates is more than justified." Senator Richard Shelby, R-Alabama, the vice chairman of the Senate Intelligence Committee said, "The tape's release is central to informing people in the outside world who don't believe bin Laden was involved in the September 11 attacks." Shelby went on to say "I don't know how they can be in denial after they see this tape." Haas attempted to secure a reference to US government authentication of the bin Laden "confession video," to no avail. However, it is conclusive that the Bush Administration and US Congress, along with corporate media, presented the video as authentic. So why doesn't the FBI view the "confession video" as hard evidence? After all, notes Haas, if the FBI is investigating a crime such as drug trafficking, and it discovers a video of members of a drug cartel openly talking about a successful distribution operation in the United States, that video would be presented to a federal grand jury. The participants identified in the video would be indicted. The video alone would serve as sufficient evidence to net a conviction in a federal court. So why, asks Haas, is the bin Laden "confession video" not carrying the same weight with the FBI? Haas strongly suggests that we begin asking questions, "The fact that the FBI has no hard evidence connecting Osama bin Laden to 9/11 should be headline news around the world. The challenge to the reader is to find out why it is not. Why has the US media blindly read the government-provided 9/11 scripts, rather than investigate without passion, prejudice, or bias, the events of September 11, 2001? Why has the US media blacklisted any guest that might speak of a government-sponsored 9/11 cover-up, rather than seeking out those people who have something to say about 9/11 that is contrary to the government's account?" Haas continues. "Who is controlling the media message, and how is it that the FBI has no 'hard evidence' connecting Osama bin Laden to the events of September 11, 2001, while the US media has played the bin Laden-9/11 connection story for [six] years now as if it has conclusive evidence that bin Laden is responsible for the collapse of the twin towers, the Pentagon attack, and the demise of United Flight 93?" The following poem was written by a close personal friend. Entitled, "Who are we? ", I'd like to share this interesting little poem here on my blog. Enjoy! How can God let this go on? How far will we get if we all think this way? A new Emmanuel Goldstein has been announced by his handlers at the CIA and Mossad as the leader of 'al CIA Duh', the farcical bogey man presented to the American public as a major threat to their well-being, safety and freedom. Al-Qaida's longtime No. 2 leader, a doctor from a prominent Egyptian family who worked with Osama bin Laden for decades, has succeeded the slain terrorist as head of the global network, the group said Thursday. Ayman al-Zawahri, who turns 60 on Sunday, has long brought ideological fire, tactics and organizational skills to al-Qaida. The surgeon by training was first behind the use of the suicide bombings and independent terror cells that have become the network's trademarks. He is believed to be living somewhere near the Pakistan-Afghanistan border and has appeared in dozens of videos and audiotapes in recent years, increasingly becoming the face of al-Qaida as bin Laden kept a lower profile. Al-Zawahri had been considered the most likely successor because of his long-time collaboration with bin Laden, and analysts had said that few were likely to challenge the al-Qaida deputy leader for the top spot. He and bin Laden first crossed paths in the late 1980s in the caves of Afghanistan, where al-Zawahri reportedly provided medical treatment to bin Laden and other Islamic fighters battling Soviet forces. Their alliance would develop years later into the terror network blamed for America's worst terror attack in its history. No Sheila, you've got it all wrong. We need to tar and feather the crooked bankers and Wall Street criminals and overthrow and imprison the government that facilitated their looting of the American treasury. Many of you may know that I am from Omaha, Nebraska, which is about 25 miles south of Fort Calhoun, site of the nuclear power plant which was recently declared a level 4 emergency by the Omaha Public Power District. Yesterday, the FAA shutdown the airspace over the plant. There has been massive flooding along the Mississippi and Missouri rivers this year. The Missouri River separates Nebraska from Iowa, and the Fort Calhoun nuclear power plant is located near the river. As you can see from the picture below, flood water has surrounded the plant. Thanks to Mike Rivero at What Really Happened for pointing this information out to me initially. Many people were scrambling at the NRC to cover up the full extent of the damage at the Fort Calhoun Nuclear Plant following an electrical fire that stopped the cooling system to the spent-fuel rods. The NRC originally reported that the fire was detected in a switchgear room at 9:30 am, by declaring a Notification of Unusual Event. Automated fire suppression systems activated as expected and the fire was confirmed out at 10:20 a.m.Thursday this was updated to an Alert, with no recognition by MSM, because the cooling systems were down for multiple hours. "During identification and evaluation of flood barriers, unsealed through wall penetrations in the outside wall of the intake, auxiliary and chemistry and radiation protection buildings were identified that are below the licensing basis flood elevation. A summary of the root causes included: a weak procedure revision process; insufficient oversight of work activities associated with external flood matters; ineffective identification, evaluation and resolution of performance deficiencies related to external flooding; and “safe as is” mindsets relative to external flooding events." A nuclear power plant north of Omaha, Neb., on Tuesday briefly lost the ability to cool a pool of used nuclear fuel after a fire at the site, the U.S. Nuclear Regulatory Commission said. The NRC said the plant recovered cooling ability without activating backup systems and "temperatures in the pool remained at safe levels." The public was not in danger because the plant has been shut down since early April for a refueling outage, the agency said. Already on guard from the rising waters of the adjacent Missouri River, the Fort Calhoun nuclear plant declared an alert Tuesday following an electrical fire that briefly disrupted spent-fuel cooling. The Nuclear Regulatory Commission reported that the plant, operated by the Omaha Public Power District, declared the alert about 10 minutes after a fire was detected in a switchgear room at 9:30 a.m. Automated fire suppression systems extinguished it within an hour, with the alert ending soon after. During that time, though, pumps for the plant's spent-fuel cooling system stopped working. The Associated Press quoted plant and NRC officials as saying one pump was returned to service within one or two hours, and a second pump returned to service Wednesday. Backup safety systems were not needed, according to the NRC. A fire in an electrical switch room on Tuesday briefly knocked out cooling for a pool holding spent nuclear fuel at the Fort Calhoun nuclear plant outside Omaha, Neb., plant officials said. The safety of deep pools used to store used radioactive fuel at nuclear plants has been an issue since the accident at Japan's Fukushima nuclear plant in March. If the cooling water a pool is lost, the used nuclear fuel could catch fire and release radiation. As ProPublica reported earlier, fire safety is a continuing concern at the country's 104 commercial reactors, as is the volume of spent fuel piling up at plants. A fire in Nebraska's Fort Calhoun nuclear power plant briefly knocked out the cooling process for spent nuclear fuel rods, ProPublica reports. The fire occurred on June 7th. The plant is reportedly at a stage 4 level of emergency, though the Omaha Public Power District (OPPD), which owns and operates the plant, denies this. UPDATE: The Omaha Public Power District has released a statement to address the "flood rumors." Hopefully, the plant will be able to withstand what's predicted as the greatest flood ever to affect the Missouri River this year. Despite the stunning sight of the Fort Calhoun nuclear reactor surrounded by water and the weeks of flooding that lie ahead, the plant is in a safe cold shutdown and can remain so indefinitely, the reactor's owners and federal regulators say. “We think they've taken adequate steps to protect the plant and to assure continued safety,” Victor Dricks, spokesman for the Nuclear Regulatory Commission, said Thursday. Tim Burke, vice president at Omaha Public Power District, said the plant's flood barriers are being built to a level that will protect against rain and the release of record amounts of water from upstream dams on the Missouri River. “We don't see any concerns around the Fort Calhoun Nuclear Station,” Burke said at a briefing in Omaha Mayor Jim Suttle's office. 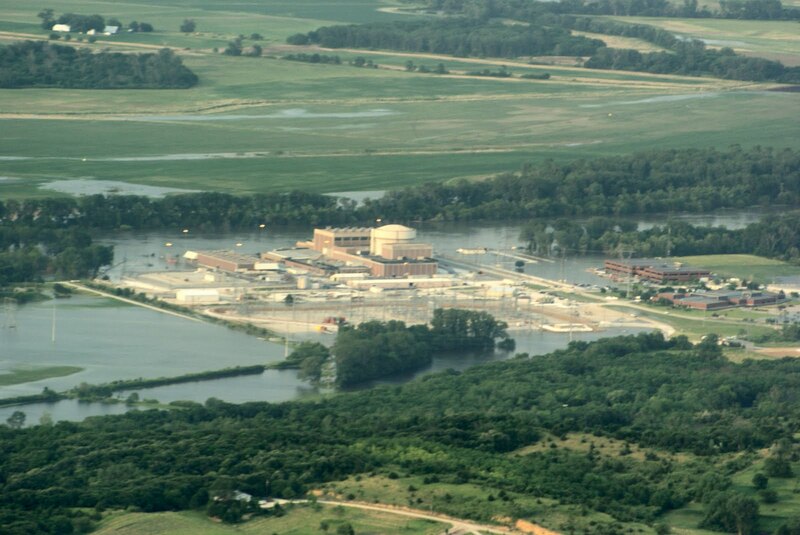 Cooper Nuclear Station, which is about 70 miles south of Omaha near Brownville, Neb., continues to operate even as it makes similar flood protections. Cooper is owned by Nebraska Public Power District. The river would have to rise about 6 feet higher for the plant to go into a cold shutdown. Time has been on Fort Calhoun's side, said David Lochbaum, director of nuclear safety at the Union of Concerned Scientists. The group is a leading watchdog of the nuclear industry. Dissident Voice has an informative article here as well. Marijuana may be good for you? Gay bloggers and other fraudulent events in the Middle East "uprisings"
After the story of the Syrian-American lesbian blogger who went missing during President Bashar Assad’s crackdown made headlines worldwide, it turns out the entire account was a hoax. Over the past few days, several news reports have surfaced indicating that the author of the blog was from Scotland, after the Washington Post has linked the alleged lesbian blogger’s IP address to Edinburgh. Pretending to be Amina Arraf, who wrote a blog called “A Gay Girl in Damascus” which documented updates about Syria’s uprising, Tom MacMaster confessed Sunday that every post on the blog has been written by him, including the whole account of Amina’s disappearance and her detention by Syrian security forces which has been reported on by various news outlets. MacMaster, indicating his location as Istanbul, Turkey, posted a last entry on the blog on Sunday apologizing to the readers, emphasizing that the facts in his posts were truly reflective of the situation on the ground in Syria, even though the narrative voice was fictional. “I do not believe that I have harmed anyone – I feel that I have created an important voice for issues that I feel strongly about,” he wrote. MacMaster claimed that he was simply trying to convey the events in Syria to a western audience through the fictitious blog. “I only hope that people pay as much attention to the people of the Middle East and their struggles in thıs year of revolutions,” he wrote. Think about it: this is supposed to be a gay, female blogger (i.e., someone willing to exercise their free speech rights publicly) that was arrested by the Syrian police, and it’s completely fraudulent. Completely made up. And what message is this propaganda trying to push? Evil Syrian police cracking down on a lesbian dissident, how terrible! When are we going to invade and bring democracy and freedom to those backwards Syrians?! It was the slap that started a revolution. When the Tunisian street trader Mohamed Bouazizi, 26, was slapped in the face by a female municipal inspector last December, he burned himself alive in protest and sparked a wave of anti-government riots that engulfed the Arab world. True or false? The woman at the centre of the controversy has now denied hitting Bouazizi and claims she was wrongly imprisoned for four months. Fedia Hamdi, 46, who has not spoken publicly about the incident until now, told the Observer that she had been used as a political pawn by the former Tunisian president, Zine al-Abidine Ben Ali. "I feel I was a scapegoat," she said. "I feel there has been a grave injustice and it hurts me to think that no one wanted to listen to my story." After 111 days of incarceration, Hamdi was freed by a tribunal in her hometown of Sidi Bouzid last Tuesday after defence lawyers demolished the case against her. Hamdi was found innocent of all charges when it emerged in court that only a single person claimed to have seen the slap – a fellow street trader who bore a grudge against her – while four new witnesses testified that there had been no physical confrontation. What we are seeing with the fraudulent Global War on Terrorism and these manufactured revolutions is an all out attempt to destroy the Islamic world, as it represents the only real threat to the implementation of a global fascist "Jewish Utopia." The formerly Christian Western world has been incrementally taken over by the Zionist fascists at the forefront of this push for global tyranny and war. These attempts to foment uprisings in the Muslim world, in addition to things like this, are partly an attempt to corrupt and erode the cultural and religious values that are still prevalent in the Muslim world, and to manufacture fraudulent "revolutions" using Zionist backed, funded and trained "revolutionaries." This announcement came shortly after the bipartisan expansion of the illegal, Orwellian "Patriot Act" and other tyrannical measures, all justified as a result of the false reality put forth by the media and political class surrounding the Zionist FALSE FLAG/INSIDE JOB on 9/11. In the videos below, Joshua Blakeney discusses Zionist Jew Jonathan Kay's pathetic, anti-intellectual attempts to denigrate the 9/11 Truth and Justice movement. These videos speak for themselves. See Deanna Spingola's website here for more. Saladin, who blogs at A Voice In The Wilderness, has made a video about Palestine that is quite heart wrenching. It's titled "Dearest Palestine 0001." Al-Qaeda is fake. This is the Jewish American spokesman of a muslim group dedicated to killing Jews and Americans. Coincidentally the videos all come from a Jewish owned Pentagon paid SITE intelligence group, and the group has yet to attack Israel decades aftyer proclaiming "jihad". This is all a zionist show dedicated to demonizing muslims, because every war needs a wicked bad guy to chase after. Adam Gadahn, who appears in the tape, converted to Islam from a Jewish-Christian family when he was 17 and a few years later moved to Pakistan. He was previously known as Adam Pearlman and grew up on a goat ranch outside Los Angeles. I'm planning on calling into Mike Rivero's radio show on Monday to ask him what he thinks about Vladimir Zhirinovsky's statements in the video above. He'll probably hang up on me, like he does his other listeners who bring up this topic. Dr. Lawrence Davidson has written a great article which was published at Veterans Today about Iran's nuclear program. Below is Seymour Hersh on Democracy Now discussing his recent article clearly indicating that there is no evidence Iran is building a nuclear weapon. Sadly, I doubt that will stop the psychopathic Zionists hell bent on wrecking and destroying that country though. Well, very simply, it’s—you know, you could argue it’s 2003 all over again. Remember WMD, mushroom clouds. There’s just no serious evidence inside that Iran is actually doing anything to make a nuclear weapon. You know, making a weapon is a big deal. You have to have fabrication facilities. You have to convert a very toxic gas into a metal and then mold it into a core. It’s big stuff, and there’s no sign of any of it. H/t to Veterans Today, once again, for the video below. See this informative article titled, "WMD Scientist, Dr. David Kelly, Suicide Coverup." Thanks to Veterans Today for pointing this one out. We will never forget the USS Liberty. On June 8, 1967, during the Six-Day War between Israel and the Arab States, Israeli fighter planes and torpedo boats attacked the U.S. Navy intelligence ship Liberty for 90 minutes in international waters, following several hours of low-level reconnaissance flights by Israeli aircraft. In the incident, 34 American servicemen were killed and 171 more wounded. Israel maintains that the attack was a mistake. The Liberty's surviving crew members, as well as a number of former U.S. government officials -- including then-CIA Director Richard Helms and then-Secretary of State Dean Rusk -- assert that the attack was deliberate and that Israel knew the ship was American. Throughout the attack, the Liberty was flying a large American flag. It also had its name painted in English in five-foot letters across the stern. In the days following the attack, the Israeli government gave the U.S. government a classified report that attempted to justify the claim that the attack was a mistake. On the basis of that same report, an Israeli court of inquiry completely exonerated the government and all those involved. No one was ever court-martialed, reduced in rank, or ever reprimanded. On the contrary, Israel chose instead to honor Motor Torpedo Boat 203, which fired the deadly torpedo at the Liberty. The ship's wheel and bell were placed on prominent display at the naval museum, among the maritime artifacts of which the Israeli navy was most proud. "The subsequent attack by Israeli torpedo boats, substantially after the vessel was or should have been identified by Israeli military forces, manifests the same reckless disregard for human life. The silhouette and conduct of USS Liberty readily distinguished it from any vessel that could have been considered hostile. . . . It could and should have been scrutinized visually at close range before torpedoes were fired." A persistent question relating to the Liberty incident is whether or not the Israeli forces which attacked the ship knew that it was American . . . not a few of the Liberty's crewmen and [deleted but probably "NSA's G Group"] staff are convinced that they did. Their belief derived from consideration of the long time the Israelis had the ship under surveillance prior to the attack, the visibility of the flag, and the intensity of the attack itself. "I believed the attack might have been ordered by some senior commander on the Sinai Peninsula who wrongly suspected that the Liberty was monitoring his activities," said [NSA deputy director, Dr. Louis] Tordella. His statement was amazingly astute, since he likely had no idea of the war crimes being committed on the Sinai at the time, within easy earshot of the antenna groves that covered the Liberty's deck. On the morning of June 8, the Israeli military command received a report that a large American eavesdropping ship was secretly listening only a few miles off El Arish. At that same moment, a scant dozen or so miles away, Israeli soldiers were butchering civilians and bound prisoners by the hundreds, a fact that the entire Israeli army leadership knew about and condoned, according to the army's own historian. Another military historian, Uri Milstein, confirmed the report. There were many incidents in the Six Day War, he said, in which Egyptian soldiers were killed by Israeli troops after they had raised their hands in surrender. "It was not an official policy," he added, "but there was an atmosphere that it was okay to do it. Some commanders decided to do it; others refused. But everyone knew about it." Israel had no way of knowing that NSA's Hebrew linguists were not on the ship, but on a plane flying high above. Nevertheless, evidence of the slaughter might indeed have been captured by the unmanned recorders in the NSA spaces. Had the torpedo not made a direct hit there, the evidence might have been discovered when the tapes were transmitted or shipped back to NSA. At the time, Israel was loudly proclaiming -- to the United States, to the United Nations, and to the world -- that it was the victim of Egyptian aggression and that it alone held the moral high ground. Israel's commanders would not have wanted tape recordings of evidence of the slaughters to wind up on desks at the White House, the UN, or the Washington Post. Had the jamming and unmarked fighters knocked out all communications in the first minute, as they attempted to do; had the torpedo boat quickly sunk the ship, as intended; and had the machine gunners destroyed all the life rafts and killed any survivors, there would have been no one left alive to tell any stories. That was the conclusion of a study on the Liberty done for the U.S. Navy's Naval Law Review, written by a Navy lawyer, Lieutenant Commander Walter L. Jacobsen. "To speculate on the motives of an attack group that uses unmarked planes and deprives helpless survivors of life rafts raises disturbing possibilities," he wrote, "including the one that the Liberty crew was not meant to survive the attack, and would not have, but for the incorrect 6th Fleet radio broadcast that help was on its way -- which had the effect of chasing off the MTBs [motor torpedo boats]." Since the very beginning, Admiral Thomas H. Moorer, appointed Chief of Naval Operations shortly after the attack, has also been convinced that the assault was deliberate. "I have to conclude that it was Israel's intent to sink the Liberty and leave as few survivors as possible," he said in 1997, on the thirtieth anniversary of the assault. "Israel knew perfectly well that the ship was American." [Regarding the] attack on USS LIBERTY by Israeli airplanes and torpedo boats . . . He said that, "You've got to remember that in this campaign there is neither time nor room for mistakes," which was intended as an obtuse reference that Israel's forces knew what flag the LIBERTY was flying and exactly what the vessel was doing off the coast. [Deletion] implied that the ship's identity was known six hours before the attack but that Israeli headquarters was not sure as to how many people might have access to the information the LIBERTY was intercepting. He also implied that [deletion] was no certainty on controls as to where the intercepted information was going and again reiterated that Israeli forces did not make mistakes in their campaign. He was emphatic in stating to me that they knew what kind of ship the USS LIBERTY was and what it was doing offshore. The CIA called the document "raw intelligence data," and said it was one of "several which indicated a possibility that the Israeli Government knew about the USS Liberty before the attack." In fact, another CIA report, prepared in 1979, indicates that Israel not only knew a great deal about the subject of signals intelligence during the 1967 war, but that Sigint was a major source of their information on the Arabs. "The Israelis have been very successful in their Comint [communications intelligence] and Elint [electronic intelligence] operations against the Arabs," said the report. "During the Six-Day War in 1967, the Israelis succeeded in intercepting, breaking, and disseminating a tremendous volume of Arab traffic quickly and accurately, including a high-level conversation between the late President Gamal Abdel Nasser of the UAR and King Hussein of Jordan. Over the years the Israelis have mounted cross-border operations and tapped Arab landline communications for extended periods. The Israelis have also on occasion boobytrapped the landlines." The same CIA report also made clear that after collecting intelligence on the Arab world, spying on the United States was Israel's top priority: "The principal targets of the Israeli intelligence and security services are:... (2) collection of information on secret U.S. policy or decisions, if any, concerning Israel." 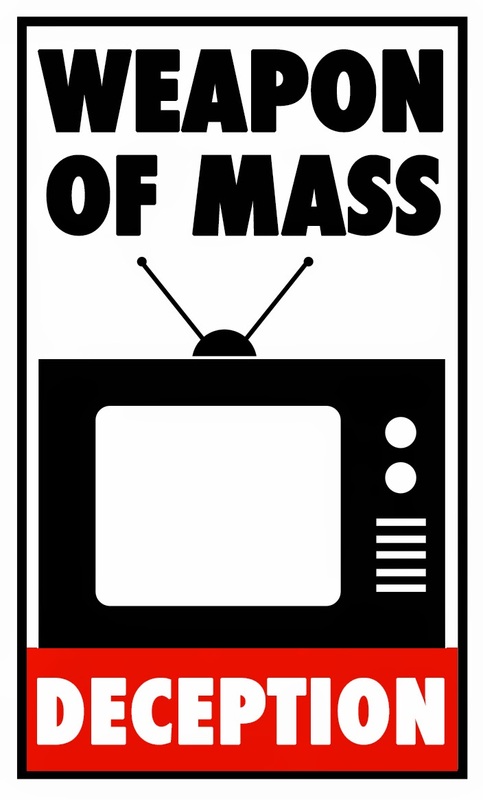 A mistake or mass murder? It was a question Congress never bothered to address in public hearings at the time. Among those who have long called for an in-depth congressional investigation was Admiral Thomas Moorer, who went on to become chairman of the Joint Chiefs of Staff. "Congress to this day," he said, "has failed to hold formal hearings for the record on the Liberty affair. This is unprecedented and a national disgrace." Perhaps it is not too late, especially for a Congress that rushes into lengthy hearings on such momentous events as the firing of a few employees from a travel office in the White House. "I was never satisfied with the Israeli explanation.... Through diplomatic channels we refused to accept their explanations. I didn't believe them then, and I don't believe them to this day. The attack was outrageous." "The evidence was clear. Both Adm. Kidd and I believed with certainty that this attack ... was a deliberate effort to sink an American ship and murder its entire crew.... Not only did the Israelis attack the ship with napalm, gunfire, and missiles, Israeli torpedo boats machine-gunned three lifeboats that had been launched in an attempt by the crew to save the most seriously wounded -- a war crime...."
"There is compelling evidence that Israel's attack was a deliberate attempt to destroy an American ship and kill her entire crew." "Nearly as bizarre as the attack itself was the reaction of the American government to the incident. A foreign nation had butchered American servicemen, sending thirty-four to their graves.... A virtually unarmed American naval ship in international waters was shot at, strafed with rockets, torpedoed, set on fire ... then left to sink as crazed gunners shot up the life rafts. The foreign nation then says, sorry about that, and offers an explanation so outrageous that it is insulting, and the American government accepts it, sweeps the whole affair under a rug, then classifies as top secret nearly all details concerning it." "Yet the ultimate lesson of the Liberty attack had far more effect on policy in Israel than in America. Israel's leaders concluded that nothing they might do would offend the Americans to the point of reprisal. If America's leaders did not have the courage to punish Israel for the blatant murder of American citizens, it seemed clear that their American friends would let them get away with almost anything." "Is there any criminal act that Israel can do without being protected from criticism from the United States? If there is I haven't seen it. And I haven't seen it from the Bush Administration or from the Clinton Administration or from any administration before them. But when you consider the influence of Israel's lobby and its political action committees and the more than $41 million they've given to Congress and the White House, is it any wonder Israel is shielded from any shame?" "On June 8, 1967, the Israeli government learned that it could get away with murder, literally, and the crime would be covered up, so strong is the influence of the Israel Lobby in our Congress -- and indeed, in the White House. And those USS Liberty veterans who survived well enough to call for an independent investigation have been hit with charges of, you guessed it, anti-Semitism." "To suggest that they [the IDF] couldn't identify the ship is ... ridiculous.... Anybody who could not identify the Liberty could not tell the difference between the White House and the Washington Monument." "Israel receives about $3 billion in direct foreign assistance each year, which is roughly one-fifth of America's foreign aid budget. In per capita terms, the United States gives each Israeli a direct subsidy worth about $500 per year. This largesse is especially striking when one realizes that Israel is now a wealthy industrial state with a per capita income roughly equal to South Korea or Spain." "The massive aid to Israel is in effect a huge entitlement that enriches the relatively prosperous Israelis at the cost of the American taxpayer. Money being fungible, that aid also pays for the very settlements that America opposes and that impede the peace process." "The Israeli puppeteer travels to Washington. The Israeli puppeteer meets with the puppet in the White House; and then moves down Pennsylvania Avenue and meets with the puppets in Congress; and then takes back billions of taxpayer dollars." "I've never seen a President -- I don't care who he is -- stand up to them [the Israelis]. It just boggles the mind. They always get what they want. The Israelis know what is going on all the time. I got to the point where I wasn't writing anything down. If the American people understood what a grip those people have got on our government, they would rise up in arms. Our citizens certainly don't have any idea what goes on." "Every time we do something you tell me America will do this and will do that... I want to tell you something very clear: Don't worry about American pressure on Israel. We, the Jewish people, control America, and the Americans know it." "Israel does not permit Palestinians who marry Israeli citizens to become citizens themselves, and does not give these spouses the right to live in Israel. The Israeli human rights organization B'tselem called this restriction 'a racist law that determines who can live here according to racist criteria.' Such laws may be understandable given Israel's founding principles, but they are not consistent with America's image of democracy." "I have spent a lot of time in Palestine in recent years.... The Palestinians have had their own land, first of all, occupied and then confiscated and then colonized. They've been excluded from their own gardens and fields, and pastures and churches. They have been severely restrained in their movements. They have to have different kinds of passes to go through different checkpoints inside their own lands on their own roads. The Israelis have built more than 200 settlements inside Palestine. They connect these settlements with very nice roads for the Israeli settlers, and then superhighways and so forth going into Jerusalem. Quite often the Palestinians are prevented from even riding on those roads that have been built in their own territory. So this has been in many ways worse than it was in South Africa." "Have our Jewish sisters and brothers forgotten their humiliation? Have they forgotten the collective punishment, home demolitions, and their own history so soon? Have they turned their backs on their profound and noble religious traditions. Have they forgotten that God cares deeply about the downtrodden? Israel will never get true security and safety through oppressing another people. A true peace can ultimately be built only on justice." "Within the United States, the main driving force behind the Iraq war was a small band of neoconservatives, many with close ties to Israel's Likud Party. In addition, key leaders of the [Israel] Lobby's major organizations lent their voices to the campaign for war. According to The Forward, "As President Bush attempted to sell the ... war in Iraq, America's most important Jewish organizations rallied as one to his defense." "Every year the United Nations General Assembly votes on a resolution entitled, "Peaceful Settlement of the Palestine Question." And every year the vote is the same: It's the whole world on one side; Israel, the United States and some South Sea atolls and Australia on the other side. The vote this past year was 164 to 7.... We have all twenty-two members of the Arab League favoring the two-state settlement on the June 1967 border. We have the Palestinian Authority favoring that two-state settlement on the June 1967 border. We now have Hamas favoring that two-state settlement on the June 1967 border. The one and only obstacle is Israel, backed by the United States. That's the problem."